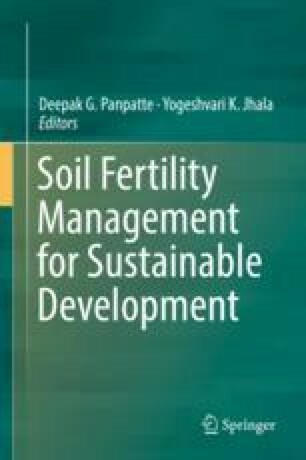 Carbon content in soils is a key parameter for soil health management and higher plant productivity sustainably. Total carbon in soil is accounted to be more than combined carbon in the vegetation and atmosphere; it contributes significantly to climate adaptation, biodiversity and nutrient recycling. These basic characteristics are essential for global food security, eco-friendly environment, and human welfare. The method of eliminating atmospheric CO2 and its accumulation in the soil carbon pool known as carbon sequestration is primarily mediated by plants through the process of photosynthesis and respiration. Ultimately, dead animal and plant residues are decomposed by microbes through their saprophytic, mutual or pathogenic activities. Thus, microbes are the chief modulators of the terrestrial carbon cycle and regulate the net carbon storage or turnover rates in soil carbon sequestration (SCS). Recent studies are shading light on the major factors involved in the mechanism of SCS and their associations with soil-plant-microbe interactions. These factors mainly include soil properties (soil depth, type, pH, pore space, bulk density, and texture), climate parameters (temperature and precipitation) and land management practices (LMPs). This chapter summarizes the basic concept of carbon sequestration, forms of carbon (organic and inorganic), factors influencing the SCS and microbial activity, microbial communities associated with SCS and their potential in enhancing the soil carbon storage. Authors gratefully acknowledge financial support from National Research Foundation of Korea, Republic of Korea (Grant #2017R1A4A1015515).